"I want to apologize to all the women I've harassed with statements like 'hi' or 'have a nice day.'" Michael Che, the new co-host of Saturday Night Live's "Weekend Update," ignited a social media uproar this week when he posted on his Facebook page about street harassment. Che made comments that many users felt were insensitive in regards to the recent viral video about a woman walking through New York City being harassed by men. His first status compared the woman being degraded and intimidated by strange men to instances where people come up to him on the sidewalk and ask him for his autograph. He then apologized for his apology, explaining that he should have considered filtering himself better. He then screenshot them and put the statuses on Instagram. He has since deleted all of the comments, however. As Che's comments went viral, reactions were fairly split, with many believing he shouldn't have made the joke. Those who are shocked that Michael Che would say something unfunny and dumbfounding obviously don&#x27;t know who he is. Those who are shocked that Michael Che would say something unfunny and dumbfounding obviously don't know who he is. @CheThinks. bring back tina and amy. please. &#x27; cause you so lame. @CheThinks. bring back tina and amy. please. ' cause you so lame. We were rooting for you, Michael Che, we were all rooting for you! Although, many have also come to Che's defense. 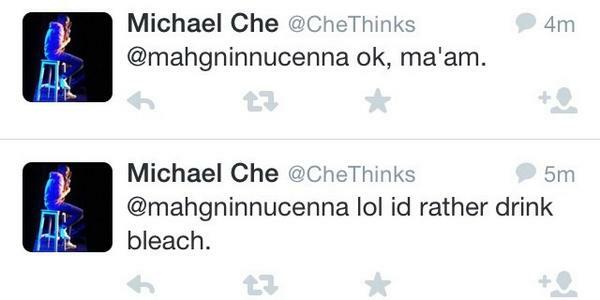 Nothing @CheThinks is anywhere remotely close to as offensive as people are saying it is. Fellow SNL cast member Taran Killam also came to Che's defense on Twitter Wednesday night. Few people people more intelligent and sensitive than @CheThinks My wife and daughter really dig him. Discernment. That&#x27;s all one can ask. Few people people more intelligent and sensitive than @CheThinks My wife and daughter really dig him. Discernment. That's all one can ask. Che appears to have also told a young female Twitter user he'd rather drink bleach than apologize and then deleted the tweet. BuzzFeed has reached out to both Che's agent and NBC for comment. Che did respond to Business Insider's Caroline Moss on Wednesday.